We believe that only dedicated, true teachers can change the society. They have the master key to shape the future generation. In our country, during ancient times, the teacher was called Guru and even today, we respect the good teacher as almost the God, who leads students to light. He shows the right path to students. To encourage sincere and dedicated teachers from all over the state of Gujarat, we honor them, one each from pre-primary section, primary section and secondary section every year. 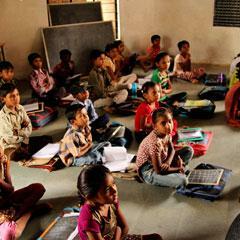 There is no such award for pre-primary teachers in Gujarat, other than ours! A search and scrutinizing committee consisting of well known educationists select the teachers. These selected teachers are then honored by giving them "Sister Nivedita Best Teacher Award". Total of 57 such awards have been presented since 1995, that include cash prize, set of books and a trophy to each school and teachers, at the hands of eminent educationists.